FLAC to MP3 Converter - Easily Convert FLAC to MP3 in few clicks! FLAC to MP3 Converter converts flac to mp3 easy and quickly. Also FLAC to MP3 Converter converts flac between a wide range of audio formats! With FLAC to MP3 Converter you can back up Audio CDs into lossless FLAC, space-savvy MP3 or any other audio format of your choice. FLAC to MP3 Converter comes with a built-in CD ripper, delivering an all-in-one CD ripping and audio format conversion solution in a single easy-to-use tool. Sometimes people look for flac to mp3 converter online or online flac to mp3 or even free flac to mp3 converter online. Convert flac to mp3 online it not the best idea. First of all you need to ulpoad often big flac file to site, then you need to wait until it will be converted, then you need to download it back. And you need to do this for each file. But with offline flac to mp3 converter you can convert flac to mp3 in batch and more quickly, without any uploads and downloads, using all the power of your CPU. 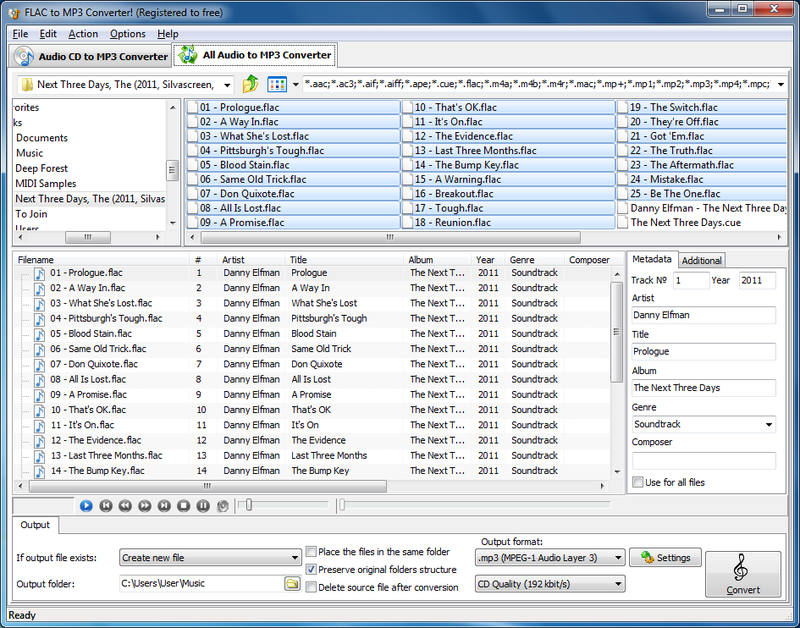 FLAC to MP3 Converter support the widest range of input and output audio formats including FLAC, MP3, AAC, OGG, and over a dozen others. 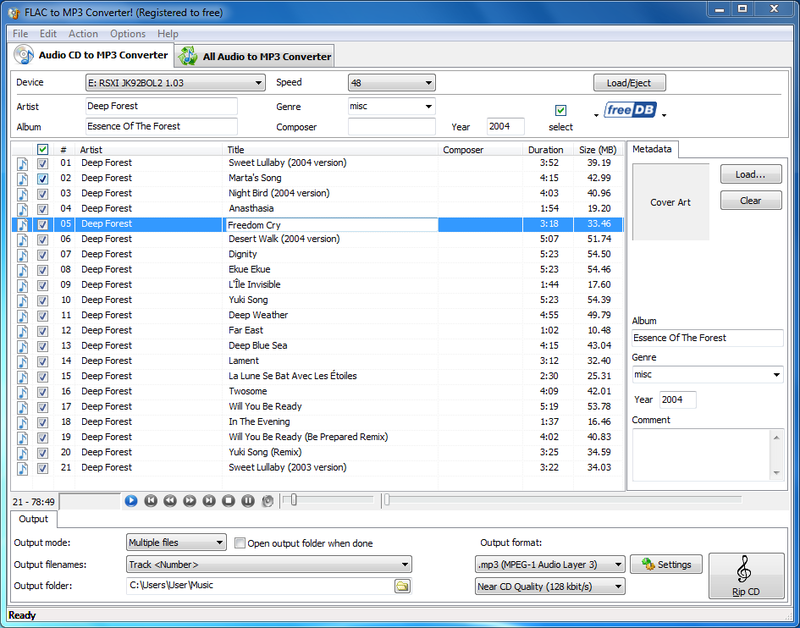 FLAC to MP3 Converter can take any number of flac audio files in any supported formats, and produce files in a format, bitrate and compression of your choice. You can convert .FLAC files to MP3’s, or turn a bunch of WAV files into OGG, or perform any other conversion depending on what your target device accepts. FLAC to MP3 Converter comes with a built-in CD ripper, allowing to back up audio CDs or creating a perfect copy for enjoying the music on the go. You can rip Audio CDs into lossless FLAC files, AAC, MP3, or any other audio format directly. FLAC to MP3 Converter automatically saves files in the format of your choice on the fly with no huge temporary files stored on your hard drive. Backing up Audio CDs is easy. Simply insert the disc, and FLAC to MP3 Converter will obtain track information from the Internet completely automatically. The tool supports the Free DB music database, automatically obtaining the artist, album and track information from the Internet. So how to convert flac to mp3? It’s not easy – it’s very easy!